A Christmas Gone Perfectly Wrong was eagerly awaited by this avid Cecilia Grant fan. Her Blackshear Family series is one for the few currently publishing Regency romance series I have consistently enjoyed. I love that her characters get into interesting scrapes and yet still feel like historical romance characters, not just contemporary heroes and heroines dressed up in period garb. This new novella highlights everything I have loved about Grant’s work in the past and would be a great introduction for anyone who hasn’t yet picked up one of her books. This robust novella features eldest brother Andrew Blackshear, who has come across as fairly stern and judgmental in the other Blackshear books. He stays true to character here, which I loved because often when a hero is portrayed as something other than the powerful protector or the charming rake, he undergoes some kind of miraculous transformation prior to his book that changes him into a more marketable type. And while Andrew does change significantly over the course of this book, it’s gradual and, given the extreme circumstances, entirely believable. The major extreme circumstance is the heroine, Lucy Sharp, daughter of a widower mainly concerned with his hunting birds and modern philosophy. She has never been into society and has very little understanding of the theology, ethics, morality and rules of behavior that are Andrew’s entire existence. Where Andrew is rules and duty personified, Lucy is chaos and sensibility. So when her coachman has an accident and can’t drive her to the Christmas house party she has been eagerly anticipating, she cons Andrew in to taking her in his carriage. It’s not surprising when nothing goes as Andrew planned. Lucy’s cheerful and oblivious disregard for propriety drive Andrew up a wall of course. His sternness and inflexibility are compromised right along with Lucy’s reputation though, making for a fun and amusing read where everything does indeed go perfectly wrong until it’s all right again. A Christmas Gone Perfectly Wrong was the last of my holiday reads. Today being the last day of Christmas, liturgically speaking, I thought it would be a nice send-off to the 2014 holiday season. I hope everyone is having a lovely New Year thus far and a happy Epiphany! 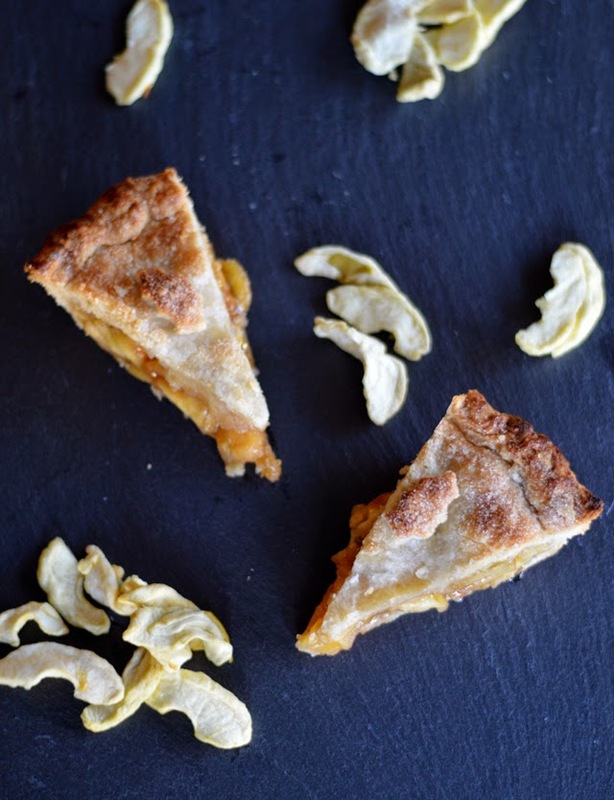 This is the easiest apple pie I’ve ever made. Seriously. 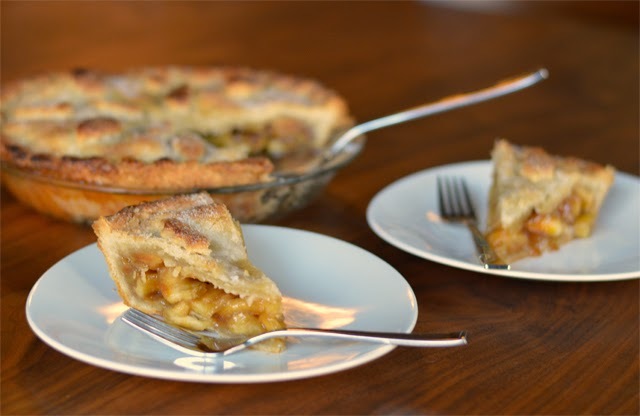 I love apple pie, but what I don’t love is peeling and coring all those apples. It’s so time-consuming! I know there are peeler/corer gadgets that makes it easier, but I have a small kitchen and am categorically opposed to gadgets that I will only use once or twice a year at most. And when I do make pie, it’s usually for an event, not just dessert for my household of two. So there are other kitchen projects going on at the same time, making all the hands-on time of a normal apple pie a pain in the…well…yeah. I’m assuming the heroine, as the unintended house guest of a down-and-out family, is using dried apples to make a Christmas pie because that’s what would have been available in December in Regency England. 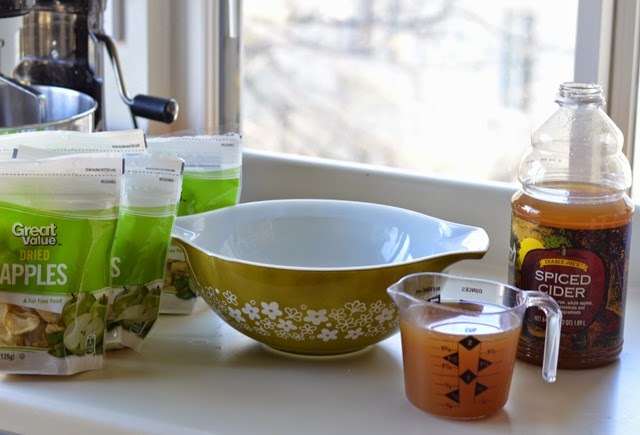 Here in the United States in the 21st century though, the biggest problem I had with this recipe was sourcing the apples. Freeze-dried apple rings seem pretty common and you should absolutely not use those. After trying all my organic and gourmet grocery store options though, I sent my husband to Walmart for a new computer mouse and finally he found dried apple wedges there. I’m not sure why they get low reviews on the Walmart site. I didn’t have any problems with them and thought they were pretty tasty just on their own. The great thing is that rehydrating the apples instead of peeling and coring fresh ones takes about an hour, but it’s totally hands-off time. They just sit in hot cider in a bowl on the counter, then you cook them for about 10 minutes to soften them up before putting them in the pie and baking. I was skeptical whether this would be any good, but I honestly would never have known they weren’t fresh apples if I hadn’t made it myself. 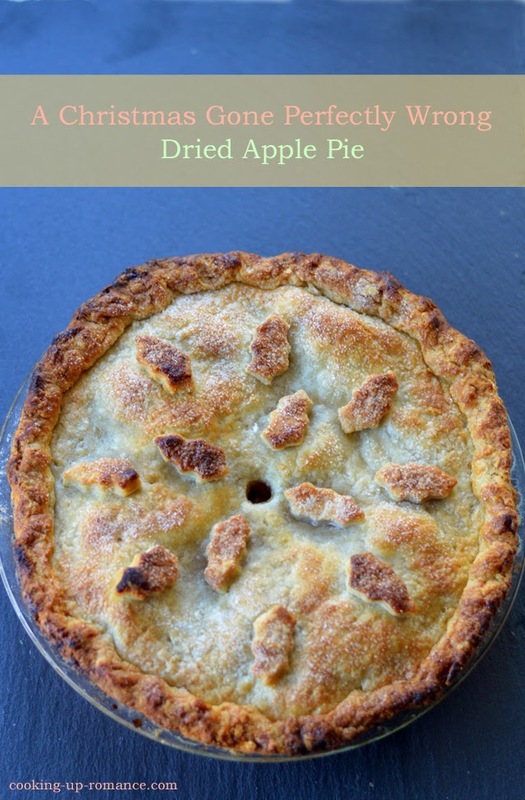 The apples really held up nicely in the pie and the texture was perfect. As for the crust, I’m never making pie crust any other way again. In the past, I had tried making pie crust with vodka, which is what the original Cook’s Illustrated Recipe calls for and it’s a miracle. Using part butter, part shortening is something I’ve always done because butter makes pie crust flaky and shortening makes it tender. But having liquid that evaporates in the oven and doesn’t activate gluten in the dough makes this pie crust almost foolproof. I say almost because 1) it’s better and easier with a food processor, which not everyone has and 2) you still have to be careful not to overmix the dough, which is true of any pie crust. 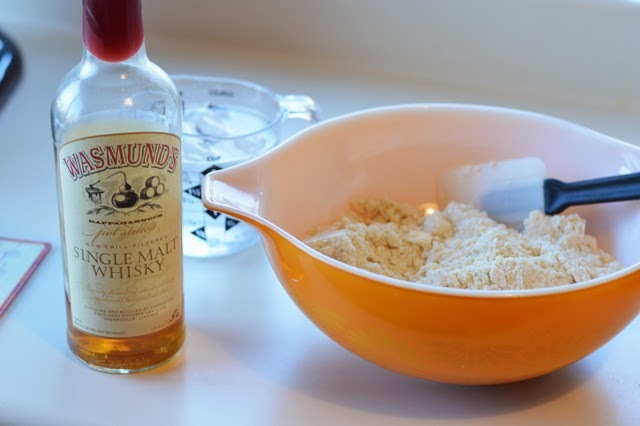 In this particular recipe, I substituted Virginia single malt whisky for the vodka just to see if the extra flavor in the pie crust was interesting and I was a big fan. Having tried it now with both vodka and whisky, I suspect that any liquor that’s about 80 proof or 40% alcohol would work just fine: brandy with peaches, rum for banana cream pies, kirsch for cherry pie. The options are pretty much endless. I intend to try them all! 2 tablespoons milk or 1 egg white for brushing top of pie. 1. 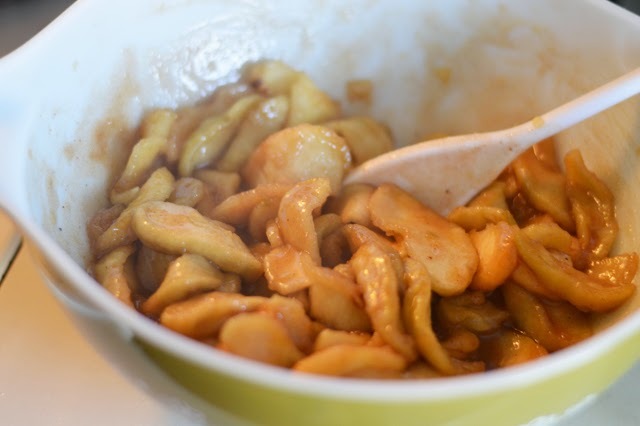 Put dried apples in a medium bowl. Heat cider to a boil and pour over dried apples. Let stand 1 hour. broken up, 4 to 6 quick pulses. Empty mixture into medium bowl. least 45 minutes or up to 2 days. 5. Preheat oven to 400 degrees F.
6. Cook apples in cider for 10 minutes or until tender. Do not overcook. They will continue to cook in the oven. 7. In a large bowl, stir together sugar, cinnamon, flour, nutmeg and salt. Add apples and stir to coat. 8. 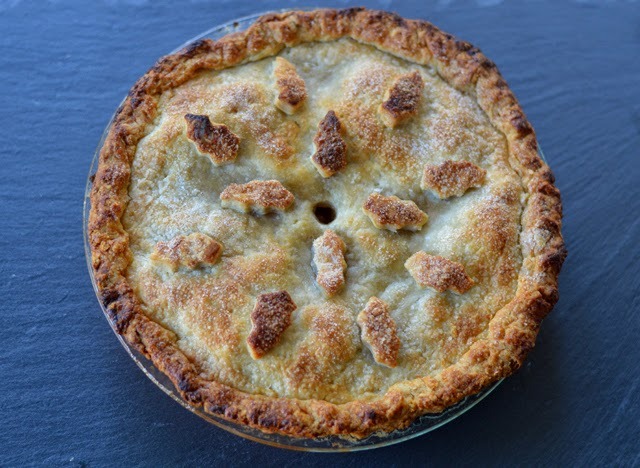 Roll out one disc of pie dough for a 9″ pie plate. Line pie plate with dough. Add apples. 9. Roll out second disc of dough and top the filling. Trim around the edges of the plate, then pinch together crusts, rolling pinched together crusts inward about half an inch. Pinch to form fluted edge. If desired, use scraps to cut out small, seasonally appropriate decorations (I used small holly leaves). 10. Using the milk or egg white, brush the top of the pie all over. Sprinkle with remaining 1 tablespoon sugar. 11. Bake for 45-50 minutes.